Dig deep into God's Word with The KJV Cross Reference Bible. This brand-new study Bible offers more than 25,000 helpful references in the centre margin, pointing you to related passages throughout scripture. Cross references indicate especially where and how major biblical themes unfold through God's Word, providing a powerful resource for personal study or Sunday school or small group preparation. Available in three handsome, sturdy bindings, The KJV Cross Reference Bible is slightly oversized and offers a very readable type face of 11 points on the Bible text and 8 points on the cross references. When you want to dig deeply into God's Word, this is the tool to use. 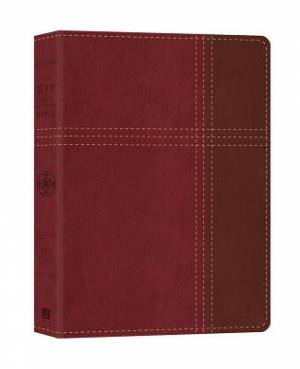 KJV Cross Reference Bible Imitation Leather by Compiled By Barbour Staff, was published by Barbour Bibles in January 2015 and is our 45942nd best seller. The ISBN for KJV Cross Reference Bible Imitation Leather is 9781630584610. Be the first to review KJV Cross Reference Bible Imitation Leather! Got a question? No problem! Just click here to ask us about KJV Cross Reference Bible Imitation Leather.